Oh my love of chrome spray paint has been revived! These are your everyday seashells sprayed with Krylon Chrome! I made cookies a while back and thanks to my ADD and inability to set timers, my cookies were a little more done than I like. I had told some friends that the bread in their bag of cookies was to moisten them up, they had never heard of this before. I soon realized there were a lot of things I do that would help out others, so here are a few. Add a piece of bread to soften up cookies, make sure not to let the bread touch the cookies, as it will make them soggy! Rotating the cookies around will help them all get soft, once the bread is near crouton state, remove or replace! I'm kind of picky about my washer being clean and the front load washers with the drawer just kills me, I have no aim with a bottle of fabric softener or bleach so I have opted to use a large hair dye applicator bottle to fill the appropriate spot. Works like a charm! There are times that I come across a project or see something that I think is a great idea, yet I still have to do it my way, especially when we are not exactly close to such great places like Hobby Lobby and Michael's. It was really no different for these projects. These are clear plastic ornaments with glitter in them, when I first saw this they used a pledge floor wax, something I don't own and sure didn't want to buy just for this. 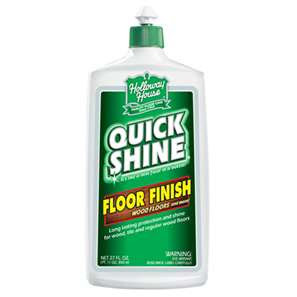 So I used Holloway House Floor Finish. Seeing how I already expressed my theory that this stuff was like runny modge podge I figured why not give it a go. Well as you can see it worked out pretty good. I squirted enough of the floor finish in the ornament to coat the entire inside and then placed the ornament to drain the excess back into the bottle. I then poured glitter into the ornament and gave it a gentle shake. Left on counter to dry and there ya go! I love these lil' beauties mostly because I won't be wearing their glitter long after they are put away for the season. We have plenty of stockings, and yet Santa doesn't seem to know where we live. So making more seems a bit silly, but I needed something to put some fabric flowers on, so this was a good enough reason to make more stockings, right? No you aren't alone, my husband doesn't really get my craft rationalizations either...These are hand sewn felt stockings made from sheets of felt purchased at Michael's. The roses are hot glue, felt and twisted strips of fabric. The lil' flowers are felt. Embroidered initials using what else but embroidering thread. We live in an area now that is suppose to have LOTS and LOTS of snow, well we weren't getting what I was told we would and the forecasters couldn't get it right so we made our own. 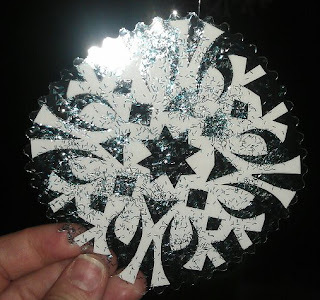 Old school paper snow flakes. We used copier paper cut in traditional snowflakes then placed them on laminating sheets and sprinkled glitter on them. I LOVE glitter, I am NOT a fan of it's near permanent adhesion to faces and it's almost reproductive characteristics, so once again sealing it in a way where we can still enjoy it's beauty makes me a very happy person! We hung 9 of these in the windows as if it would entice Mother Nature to bring us some real snow. These are a tradition in our house, same clear plastic ornaments used as "memory ornaments" from fun trips or events of the year. These have white sand from Florida and pure red dirt from Oklahoma, just two places I visited this year.